Roomy art-filled mountain house with wonderful views on gorgeous, secluded property, surrounded by state reserve and only minutes from hiking, biking, skiing (downhill and cross-country), golfing. fishing, antiquing and swimming. Gardens surround the house with beautiful flower and rock arrangements. 4 private bedrooms with double beds, 1 with attached full bath and another with separate full bath. Lower level has rec-room with wet-bar and pool table and plenty of board games. Gourmet kitchen, large gas and charcoal grille with dining room or outside deck-dining overlooking splendid gardens. 2 TVs; one is wide screen smart TV with HBOGO, Netflix, Amazon Prime, Hulu, DVRs, DVD players with wonderful DVD library, cable with HBO/Showtime and other premium channels. Satellite internet with WI-FI. House is very tastefully decorated with classic midcentury Danish Furniture and antiques. There is artwork in every room, and also on the grounds outdoors. Sleep in the lap of luxury with 400 count cotton sheets, multiple down pillows for every guest, and down comforters. We also have high quality non-feather bedding for those who are allegoric. BUT before you sleep, rest your tired bones, especially after a day of skiing or hiking in our outdoor hot tub. You can let the jets massage you while looking at the mountain views, or up at the stars. All rooms have flowers and greenery during the winter and early spring. Bennett Wine is an artist who shows his work throughout the Eastern United States. Dr. Helle Thorning does research and heads an organization that provides assistance and advocates for the mentally ill.
We bought this house because we love to hike, bike and partake in many outdoor winter activities. With a spacious, comfortable interior, it can be both an intimate cozy nest and easily house up to 10 people when we have large gatherings. 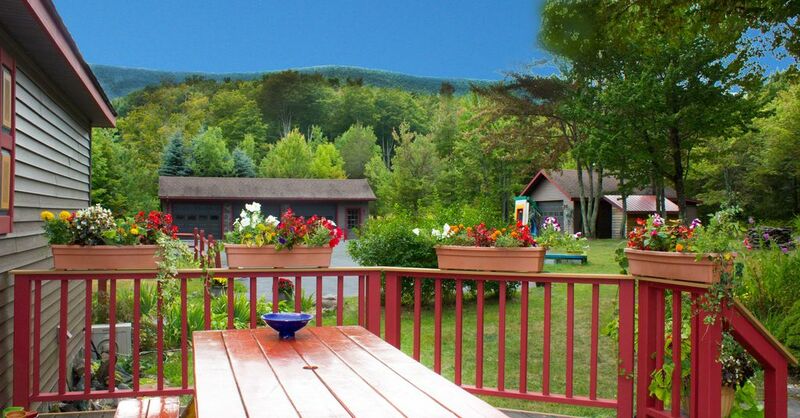 We love the gardens and the mountain views, and the fact that it is directly across the street from the Catskill Mountain preserve with fantastic trails, waterfalls and interesting ruins and artifacts. All beds have 400 thread count cotton sheets, down pillows, and down comforters. We also have high quality non-feather bedding for those who are allergic. One car can be in the garage and the driveway has parking for 3 additional cars. Parking for one in the garage. There are some dry foods available for use. 2 sets of dishes and all the utensils and sharp knives that you need. Gourmet kitchen with everything needed to whip up a feast or just have a snack. Smart TV with HBO GO, Amazon Prime, Netfix. Also, on cable we have HBO, SHOWTIME, and others. Front porch with breakfast table and mountain views. Surrounded by beautiful flowers in the spring/summer/fall. Back porch surrounded by flowers and gardens, has picnic table and plenty of chairs. With Table and plenty of Adirondack chairs and ottomans. 5 person hot tub with mountain views during the day and the starlit views at night..
We immediately felt at home when we arrived (it was cold and snowing, so we were mostly indoors). The layout of the house is pleasing and practical. All of the open spaces (loft, parlor, dining room, kitchen and the den in the cellar) felt good to be in. There were often four people at a time working in the kitchen, sometimes five, nice flow. Beds are good, seating is comfortable, aesthetics are wonderful, wifi is... well... good for insulating oneself from the demands of work, shall we say, though the owner told us he is actively working at getting high-speed internet to his halcyon hideaway. There was a slight problem that developed on the night of our first day (Christmas, btw); we called the owner (in NYC, btw), who in turn called and called until he got local service people to come out to fix the problem; he even called the next-door neighbor who came over to see that we were ok. Finally, after we returned home, the owner called to say he'd found some stuff we'd left behind; I think he was calling from the post office to confirm he had the right mailing address. Very fair and responsible host and super easy to communicate with. We plan on returning in warmer weather. This place is a well-tended gem in a beautiful locale. Our family rented this property for five days in June. The Catskills are especially beautiful in the summer (and fall, and spring, and winter). As we drove up the hill and saw the house that first day, we knew we had made a good choice. There is a rolling lawn peppered with original modern sculptures, and flower beds all around the house, which is completely surrounded by mountain views. The house is comfortable, if a bit quirky, with plenty of room for our family of 8. The four kids all stayed in the basement, which is a recreation room with abundant sleeping sofas and beds. The adults spread out among the two bedrooms on the main floor and the spacious loft above. We spent most of our time outdoors on the wonderful deck, enjoying the beautiful views and watching the kids play in the yard and the woods. We cooked all of our dinners on the grills (there is a gas and charcoal grill, both of which we used nightly) and ate at the picnic table on the deck. The kitchen is well stocked, both with cooking utensils and spices. While Phoenicia, Big Indian, and Hunter are all relatively nearby, we chose to spend our days right there in West Kill. We took enjoyable hikes, of varying lengths and difficulties, in the nearby NYS forest lands every day. All in all, our five days in West Kill were just what the doctor ordered--plenty of sunshine, outdoors living and playing. Thanks to Bennett and Helle for sharing their mountain paradise with us. Beautiful memories are made here! Eight of us (all adults) had a wonderful stay! The owner is very detail-oriented and provided everything for a very comfortable vacation - brochures, hiking maps, kitchen 'essentials' (& more), suggestions for activities, games and an extensive movie library. This home is clean, spacious, and well-stocked with all necessities. It is also a mini-gallery in its own right with the owner's art and sculptures. The property is picturesque and a delight for nature lovers. Skiing, horse riding and small-town exploring are nearby and every level of hiking begins at the doorstep. The Catskill forests and trails are spectacular and made every one of us want to be a photographer or writer. Since no light interferes, star-gazing was amazing. Although we thought a snowless winter would disappoint, we had so much to see and do. No regrets, only wonderful memories! Thank you, Bennett! Set in the beautiful high peeks region of the Catskill Mountains with property surrounded by state reserve with spectacular streams and waterfalls. 7 Miles from the most stunning walking/hiking trails in the Catskills. 25 miles from historic Woodstock NY. Art, arts and crafts, and fine dining within a 15 minute drive. Surrounded by streams with some of the best fishing in the east. Tubing, rafting, and world class kayaking and kayaking competition just a short drive away. Biking for both the leisurely cyclist and the most ambitious. Great golfing on a exquisite private range in Windham. Mountain biking on both single path trails and with lifts to take you and your bike to the top of Hunter Mountain. World class competitive mountain biking at Windham and Bellayre. Music festivals at Hunter, Woodstock, and Phoenicia, all within a short driving distance. Drama festivals at Woodstock and Mount Tremper. 15 minutes from 3 ski areas; Hunter, Windham, and Bellayre. Pets are charged at $20 per day.